It’s made of creamy custard mixture with a caramel base and caramel glaze. It’s eaten throughout the world especially in the Philippines. Ever since Spain brought it in, the leche flan has always been present during celebratory occasions especially on Christmas. In fact, the dessert is considered an ideal Christmas gift. Indeed, this layer upon layers of goodness is the perfect dessert. Just like any dessert no matter how famous, there is also an endless variety of leche flan recipes. The ingredients changed from what was commonly used to whatever is in season or available. For instance, instead of using vanilla in the mixture others use lemon, dayap or calamansi. Though these are citrus fruits, their taste are different from each other. Not to mention, the amount you have to add in the mixture varies as well. Despite the adjustments and substitutions, there is always a leche flan that will suit your taste. Besides the ones sold at weekend markets and groceries, restaurants also serve this custard dessert. Try the leche flan at Abe, Chicken Deli, Max’s Restaurant, Oliva Bistro Cafe, and many more. If none of their leche flans satisfy your sweet cravings, then why not make your own version. It’s really easy and fun to make. All you need are the following. For this recipe, you won’t need the egg whites. So I encourage you to prepare a large bowl for the yolks and a container for the whites. After separating the yolks from the egg whites, make sure to store the egg whites properly. Cover the container and place it in the fridge. Take note that you can only store the egg whites for two days. But you can also pour them in ice cube trays and freeze them which makes them last for three months. Now, you might be discouraged in making your own leche flan. Please don’t be because you can use these egg whites. You can cook the egg whites like a regular egg or make fluffy meringues. Now for step 2, using a fork or whisk beat the yolks. Carefully add in the condensed milk and mix well. Then pour in the evaporated milk and again mix well. To make your leche flan creamy and smooth, you will need another large bowl and a strainer. Doing so removes any solid residue from the egg. Once done, add in a tsp of vanilla. Take note that I didn’t add sugar in the mixture because condensed milk is already sweet. For this step, you have two choices. You can put some sugar in the mold or llanera then heat it on top of the low fire. Or, heat all the sugar in a pan. Once the sugar caramelize, carefully distribute it. Make sure that the caramelized sugar is properly and evenly spread out in each mold. Let it settle for 5 minutes. Once the caramelized sugar has settled, pour in the liquid mixture on each mold. Then cover each with an aluminum foil and steam for 30-40 minutes. Take note of the time. When 30 minutes has passed, get a toothpick for each mold. Dip it and check if the mixture is already cooked. If not, continue to steam for another 5 or 10 minutes. Usually 40 minutes is the maximum. Once the mixture is cooked, let it cool down then refrigerate. After chilling, carefully flip it over to remove from the mold enabling a glaze of caramel rolling down. Indeed, nothing beats a perfectly chilled leche flan glazed in caramelized sugar. I believe this dessert is not only suitable for special occasions. 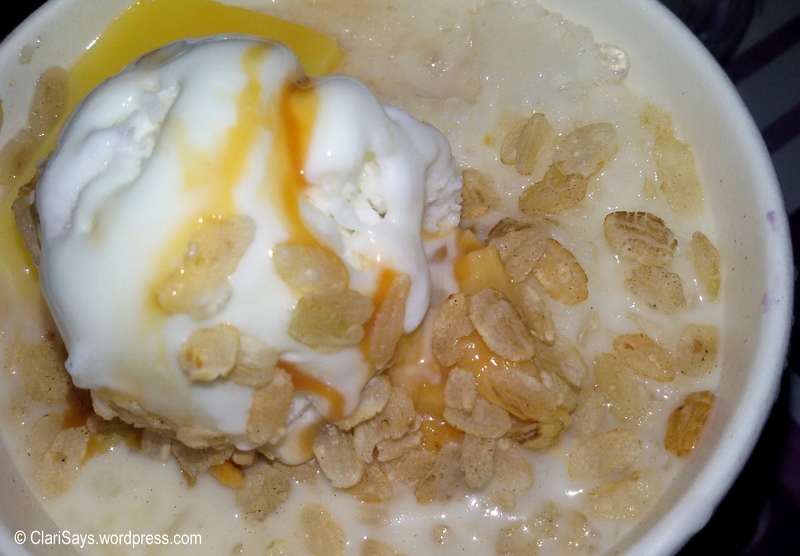 It’s perfect as it is, or served on top of another Pinoy favorite which is the halo-halo. It can even be on top of a chiffon cake. Now that’s one sweet and versatile dessert – the leche flan.